Many thanks to those of you who gave your feedback and ideas in response to our recent open letter describing our ambition to do a credible study that would scientifically prove the long-term benefits of doing Pilates exercises, particularly in helping people stay fit and flexible as they age. Your comments were really useful and much appreciated. So, we wanted to give you an update. We’re progressing the idea by putting together a document/proposal designed to help us find the right people to support and back the project. wA draft cover is shown here for your interest. We’re still in the very early stages but hoping to make progress over the coming months. One of the key advantages of Pilates is that it offers relief from lower back pain. Lower back pain is an extremely common health problem that is difficult to solve. Pilates offers a solution via lower back pain exercises. Back problems are only made worse by our tendency towards sedentary and desk-based lifestyles. 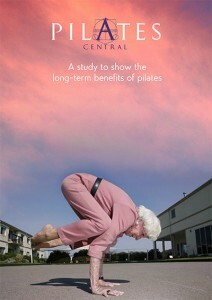 Unsurprisingly, back problems are the single most common reason that our clients give for attending Pilates Central. At least three in five of us can expect to suffer back pain at some point in our lives. Many of the treatments offered by conventional medicine address the symptoms rather than the underlying cause. Yet it doesn’t need to be this way. Pilates provides a stronger, healthier back and better posture, which in turn provides the best long-term solution to the most common kinds of back problems. 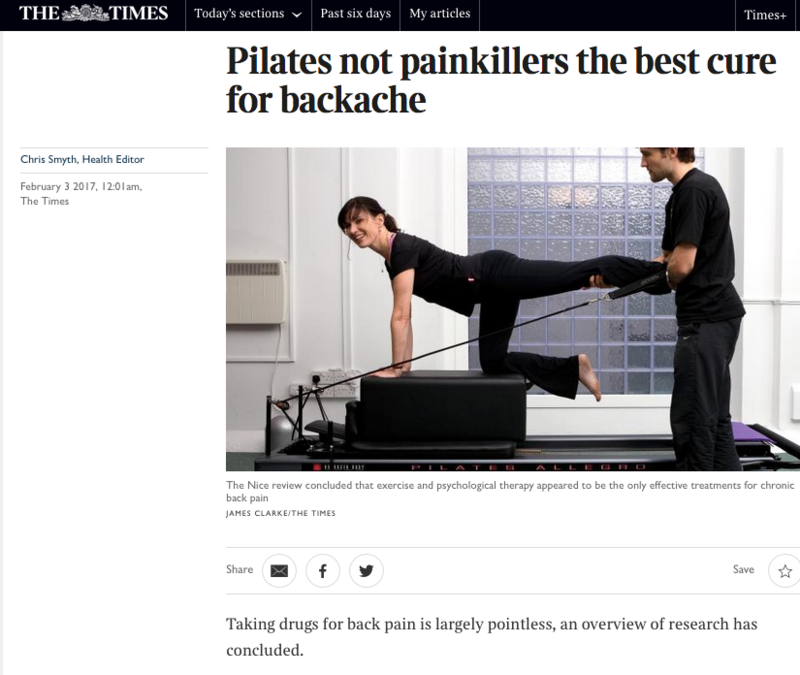 Or, as a headline in The Times (above) declared recently: “Pilates not painkillers the best cure for backache”. Celebrities ranging from the actress Jennifer Aniston to tennis star Andy Murray have praised Pilates for helping their back problems and improving the health of their backs. Pilates can both alleviate existing back problems and prevent future ones by straightening the spine and improving posture. It does so both by strengthening core muscles and by improving awareness of how the way that we move can stress the spine. In addition, good posture is both crucial to the health of your back and central to Pilates. The combination of core strength, flexibility and balance, which Pilates promotes, leads to good posture. Learn to stand straight and you will breathe better and digest your food more efficiently. You will also walk taller, feel slimmer and look longer, leaner and younger. Place your bones correctly and you’ll get the right muscles working, supporting your joints rather than stressing them. Stand properly and you will also maintain the natural balance and correct length of your muscles. Poor posture, on the other hand, can cause many problems – ranging from lower back pain to the sort of rounded shoulders and stooped appearance which can come with age – of the kind that end up being treated by physiotherapists, osteopaths and chiropractors. Joseph Pilates discovered that if he hollowed his navel back towards his spine, his back felt protected. He was using the deep postural muscles to stabilize the spine and achieve what physiotherapists now call ‘core stability’. This strong centre forms the basis of the Pilates technique, providing the support that your body needs to function properly and freely. If in doubt, it’s always best to check with your doctor before embarking on any fitness programme, but remember what Joseph Pilates told his clients: ‘You are as old as your spine’. Keep yours healthy by building strength from the inside out. To find out more about how Pilates could help alleviate lower back pain through specialist lower back pain exercises, give us a call.